Click the map above for specific directions. Take I-290 (Eisenhower) and head to Oak Park. Exit at Harlem Ave – it’ll be on your left. Head north on Harlem for about 2 miles until just before the elevated train tracks. At that stoplight, turn right onto South Blvd. Continue on South Blvd for 2 short blocks. If you are coming from the city, it’s most direct to use the CTA Green line. Take the Green line west until the last stop on Harlem Avenue. Once you arrive, walk back toward the city (east) on South Boulevard for about a half-block. We’re just past Marion Street at 1041 South Blvd. From farther flung suburbs, use the Metra rail system. Get off at the Oak Park stop on the West line to/from Geneva. Once you’ve arrived, walk east on South Boulevard for about a half-block. We’re just past Marion Street at 1041 South Blvd. Still need help with transit? Try using the RTA goroo® trip planner. 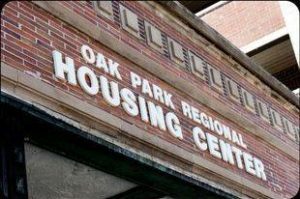 Once you live in Oak Park, you can leave your car at home! Check out the “Oak Park’s Green” section for local transportation alternatives.